Lying on the eastern coast of Spain, the Costa Blanca draws millions of tourists each year to its turquoise waters and miles of white, sandy beaches. 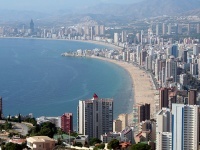 Alicante is the capital and major city on this stretch of coast, but it is Benidorm that attracts the most visitors, and this is the place to go for those looking for a lively and entertaining holiday with hundreds of bars and all-night clubs. However there is more to the Costa Blanca than crowded beach resorts: within the mountainous interior there are a series of fascinating medieval towns and fortified villages which have been largely unaffected by modern development. Alicante is best known as the gateway to the many glittering resorts in the region, but the city is actually an interesting urban destination, with history and culture aplenty to offer those who can be distracted from the beach. Those who have some time in Alicante should head to the Catedral de san Nicolas from which the narrow old streets of the historic quarter, El Barrio, radiate outwards. The most popular time to visit the Costa Blanca is between May and October when the weather is guaranteed to be sunny and warm most of the time. The temperature can get up to 104°F (40°C) in August, with the sea at a very comfortable 77°F (25°C). It is too hot and crowded for some during this busy summer season and some visitors holiday in the spring and autumn months, when it is cooler and there is the chance of light showers. However, many of the bars and restaurants close outside of the peak tourist season.